Agency submitted articles to the Red Bluff Daily News and Corning Observer. ...because a rind is a terrible thing to waste! According to CalRecycle, organic waste includes the following material: food waste, green waste, landscape and pruning waste, nonhazardous wood waste, and food-soiled paper waste that is mixed in with food waste. Food waste examples can include solid, semisolid, and liquid food, such as, fruit, vegetables, cheese, meat, bones, poultry, seafood, bread, rice, pasta, and oils; coffee grounds and filters and tea bags; cut flowers and herbs; and any putrescible matter produced from human or animal food production, preparation, and consumption activities. Food waste includes food-soiled paper which can include napkins, paper towels, tissues, egg cartons, and some paper plates and cups. For more information about organic waste or California's Mandatory Commercial Organics Recycling law vist the CalRecycle page here. SB 1383: Short-Lived Climate Pollutants, once implemented, will amend the definition of organic waste to also include the following: applicable textiles and carpets, manure, biosolids, digestate and sludges. You can find more information here about SB 1383. Composting is nature's way of recycling organic wastes! Compost is the finely decomposed remains of animals and plants commonly used as a soil amendment or fertilizer. It is a natural product of great value. It can be used as mulch, but not all mulches are compost. Mulches can be rocks, cloth, plastic, or almost any material that helps suppress weeds and retain moisture. Check out the Backyard Composting page to find out how to build your own compost pile, view our worm composting brochure or take a look at our comprehensive composting booklet. Find this information and more at the US EPA Composting for Facilities website. Vermicompost is a natural process of using earthworms (and associated micro-organisms) to break down organic waste and convert it into a rich material loaded with plant nutrients called worm castings. This dramatically speeds up the composting process and boosts the nutrient content of the end product. Grasscycling is a natural process allowing grass clipping to remain on the lawn. By staying put, clipped grass blades encourage a healthy lawn by adding valuable nitrogen to the soil. For best results, use a mulching mower and mow less than 1/3 the height of the grass. 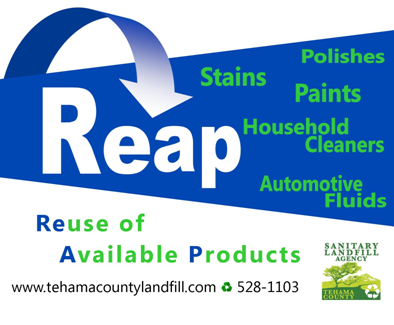 Please note, out-of-county waste is not accepted at the Tehama County/Red Bluff Landfill. Subscribe to a trash collection service provider. Locate your garbage and recycling company. Self-Haul your trash to the Landfill. See Self-Haul Tips, Landfill Acceptance Policy, and Landfill Fees. Throwing material away in the trash should be the last resort!